George Bryce of Star Racing drew the biggest crowd following his presentation at AETC, as engine builders asked followup questions. Consider the following engines that run in NHRA Pro Stock and Pro Stock Motorcycle: 500 ci GM V8 with a 1.322:1 bore/stroke ratio; 160 ci Buell V-twin with a 1.323:1 bore/stroke ratio; and 112 ci Suzuki four-cylinder with 1.327:1 bore/stroke ratio. Comparison of big-bore pistons, depending on the application. A self-confessed horsepower addict, Bryce spoke on the dynamics of big-bore engines, emphasizing what many in the room already profess, but spicing the discussion with power tricks learned over nearly 40 years of engine building. 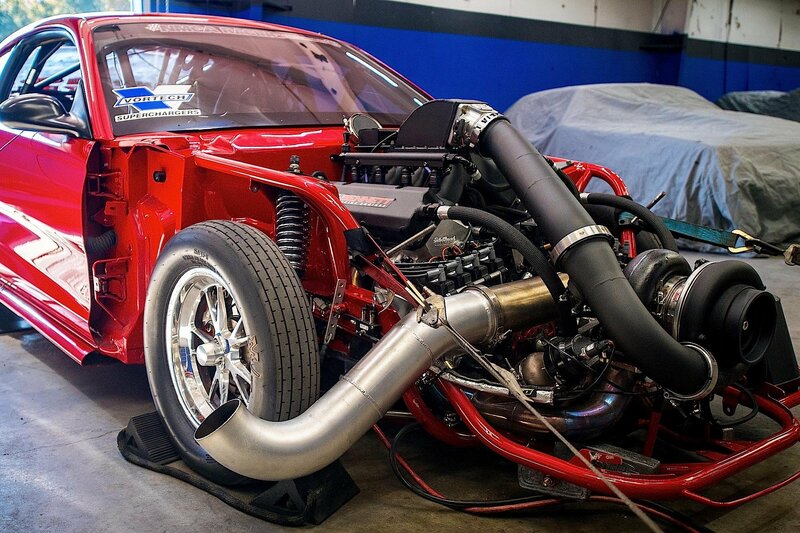 Why go with the biggest bore possible? Because it allows for the biggest valve possible. A big bore can certainly unshroud the valves. Need proof? Flow a cylinder head with the appropriate bore fixture, then switch to one a half-inch larger. “It almost always flows more,” says Bryce. S&S Cycle handled the machine work on this V-twin block. Rod length doesn’t really enter into the equation after determining stroke to meet either the rules or fit within the cylinder block confines. “Rod length [to stroke ratio] can be between 1.5:1 and 2:1 and I’m happy,” says Bryce. Bryce’s main venue is quarter-mile motorcycle drag racing, so he’s interested mostly in WOT, high-strung horsepower. Bryce giving his presentation at AETC. Bryce offered an eye-opening historical insight when he recalled his first Racepak with the paper-stripe printouts while running a 12,000 rpm Suzuki in the mid-’80s. Included was a histogram of the RPM and time. Bryce cautions against selecting a ring with too little tension as it may loosen up with each run. ‘Make sure you don’t start off too low and end up being a smoker,’ he warns. Getting back to big-bore dynamics, Bryce says the limiting factor is most often is simple real estate, with bore spacing the crucial dimension. Chart from Total Seal used during Bryce’s presentation that demonstrates where combustion pressure can get by the ring. 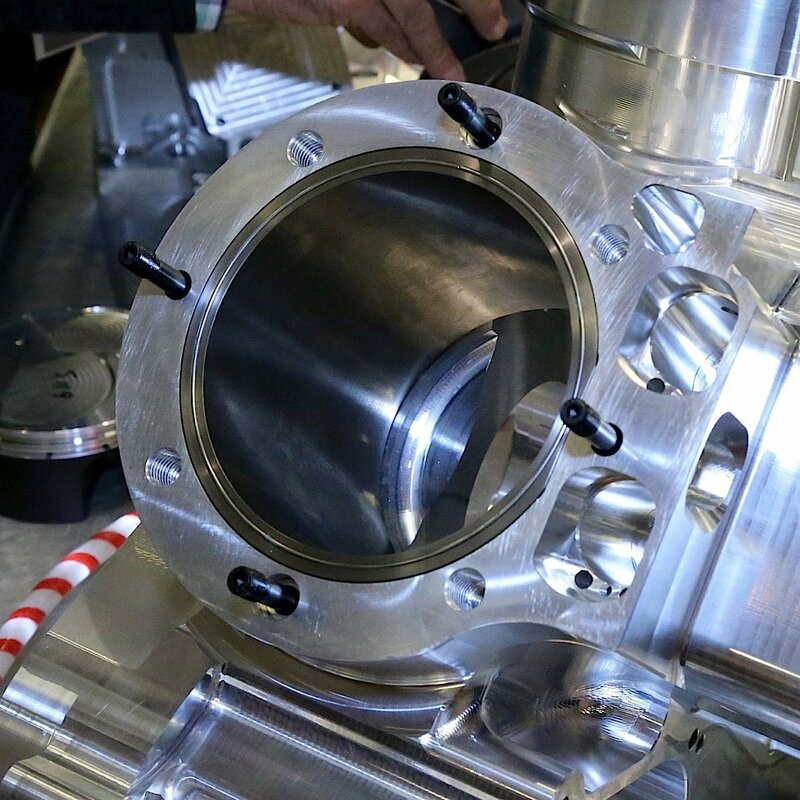 Advancements in piston design have helped engine builders improve durability and has also given them options such as center balance and ring-stack placement to suit their needs. One trick that often gets overlooked is gas porting. Gas ports will quickly bleed off pressure behind the rings, so there’s less friction to overcome, according to a graphic offered by Bryce. Engine builders can also use thinner rings with less radial tension. Too vertical or steep of a cross-hatch angle can create excessive blow-by. Also, there could be high ring rotation speeds that could lead to ring end gaps aligning on the piston. Bryce says that problems with the gas ports plugging was more of a concern in the early days, but today’s engines have more sophisticated oil-control features and lighter synthetic oils that help keep the piston tops clean. Two rather dominating subjects came up often during Bryce’s presentation: ring seal and crankcase vacuum. “You’ve got the best, highest-flowing cylinder head, and if you’re blowing the rings you’re leaving a lot on the table,” promises Bryce. Ring seal is directly related to the surface finish of the cylinder. Too flat or shallow of a cross-hatch angle may create oil-control problems because the oil is pushed sideways, not down the cylinder. It can also create excessive blow-by as a flat angle causes ring chatter during their travel. “Ra (the roughness average as measured with a profilometer) doesn’t help us anymore. Now we look at Rpk (reduced peak height). 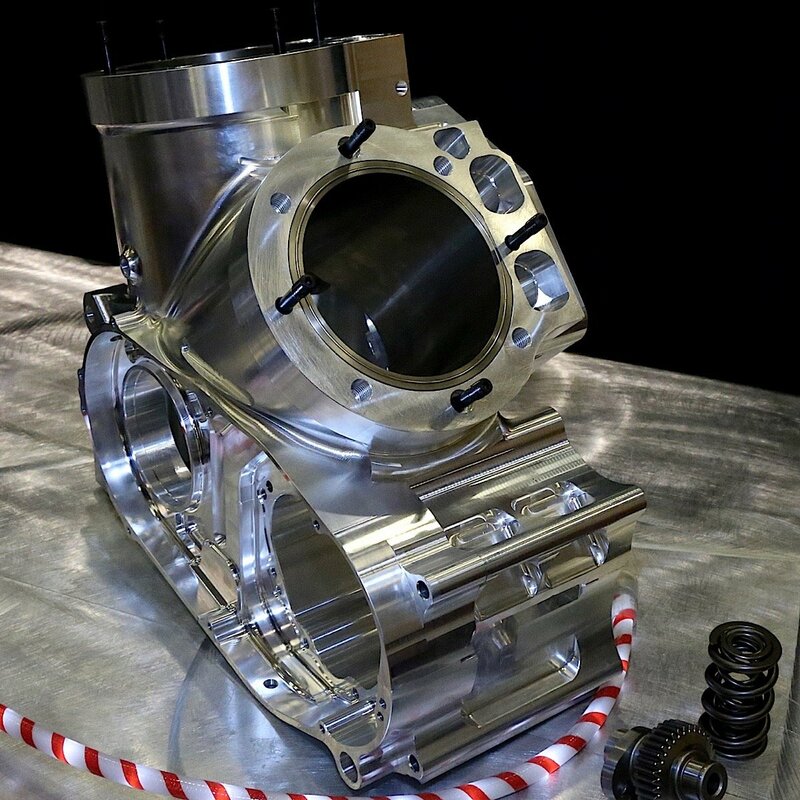 And Rvk (reduced valley depth) is very important in high-load, high-RPM engines,” says Bryce. “It’s the valley in the cross hatch that holds the oil for us. 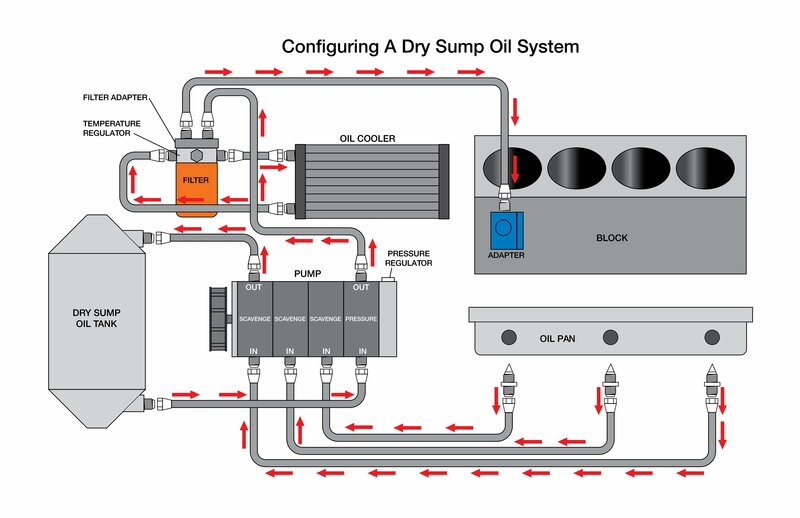 And the higher load and RPM, the more oil we’re going to need for the skirts and rings. Start with a 220 grit to create valleys for the oil. Hone within .002 to .003 of the final bore. Follow up with a 280-300 grit to within .001 of final bore. Bryce says this step helps eliminate the peaks but maintains the valleys. Use a 400 grit to hone to within .0005 of final bore. Finish to size with a 600 grit. Regarding break-in oil, Bryce has tried different game plans, starting with using break-in oil, even qualifying with it, then switching to light-viscosity race oil for the eliminations. And he has also started the weekend off with race oil on the new rings and cylinder. Views of a Pro Stock Motorcycle V-twin block with a bore over 5.1 inch. 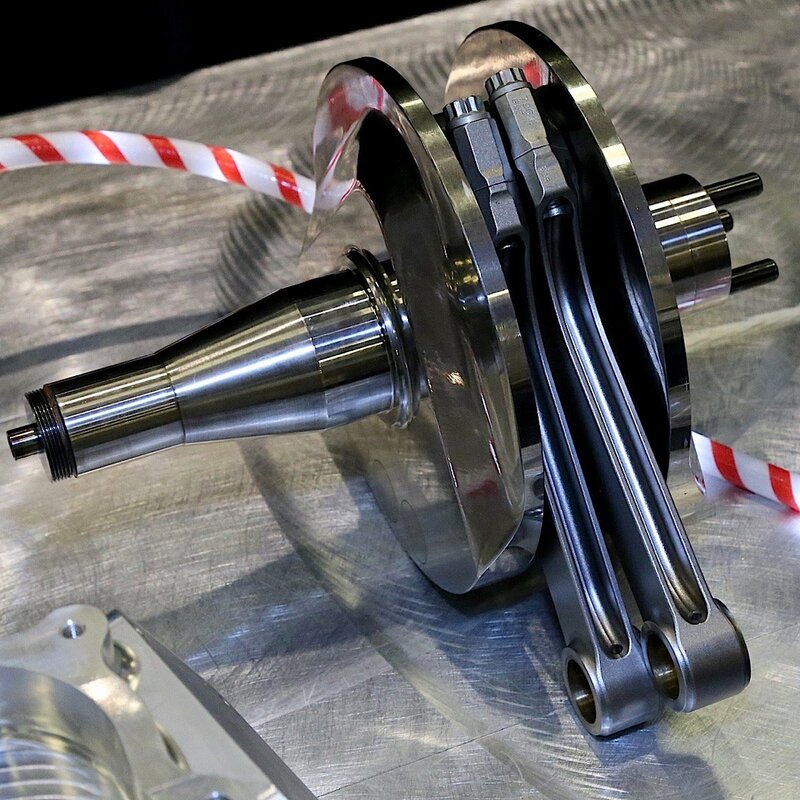 When ordering pistons, Bryce recommends an accumulator groove between the first and second rings. Amplifying that point, Bryce touts the benefits of a light top ring. Other parts designed for the big-bore V-twin. Bryce is also a strong advocate of vacuum pumps, and discounts myths heard around the pits or found on Internet forums. Bryce theorizes that when vacuum pumps first appeared in drag engines, the trend toward lighter parts had racers using the thinnest wrist pins possible. That history lesson echoed another trend reversal that engine builders have recognized. Close-up of big-bore V-twin piston. As as example, Bryce recalls when all Pro Stock teams were running aluminum rods to save weight. One team made the move to steel rods and added 200 grams to the bob weight. “Today, today everyone is running steel rods because you make more power and go faster. You can run closer piston-to-head clearance,” says Bryce. One closing thought. Bryce stresses that the above information is strictly his way of thinking and approaching horsepower gains. But there is a caveat.